After running a successful teepee business for seven years, I got some ideas about starting something fresh involving treehouses. I loved building dens but knew nothing about treehouses – even though as a kid I would spend all my time in the woods to build them for myself and my friends. With an interest from childhood, it seemed like a natural progression from being a kid but there were no treehouse schools! The first step was to try and work out how to build the best treehouses using the best materials and safest technology for attaching to the trees. I found Pete Nelson who now does the Treehouse Masters TV show. At that time he ran workshops in the US which I attended. During this time he had built a huge treehouse which really inspired me to start my own project. On my return to the UK, I got a job at Knepp Castle in West Grinstead building treehouses as part of their rewilding project. It was a really great experience because everything came from the estate and was, in essence, a true part of the estate from the beginning. Having selected the trees we felled them, milled them and turned them, crafting them into the final products just half a mile from the raw product. I had a free rein on the design and so was able to experiment and develop a style, coming up with some really interesting shapes. These were hard to build but looked and felt great. This initial process gave me the ideas which formed the design ethos for the New Leaf Treehouse Company. This led to the development of a standard template which can be built on creating treehouses that complement their surroundings and are a breathtaking experience to stay in. When you are in a New Leaf Treehouse you are completely immersed in the tree and feel completely connected to nature. This is the ethos of our whole company and we’re dedicated to respecting nature with our designs. After six successful years building a trusted reputation, New Leaf Treehouse Company has set a target of creating 100,000 treehouse memories from people staying in their builds throughout the UK and beyond. As further growth occurs, the principles will remain the same: a strong focus on using local and sustainable suppliers. Where possible, materials are sustainably grown or manufactured in the UK including Sweet Chestnut and Douglas Fir. 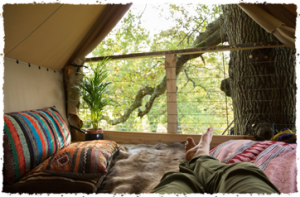 New Leaf Treehouse Company has worked with both glamping companies and private clients, and can create spaces ideal for creative workshops, hen parties and much more, with easy access and an ingenious use of space. Join us and create a new story based in nature. 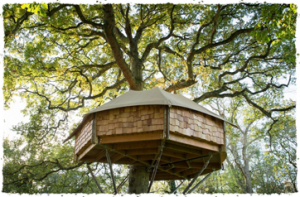 If you would like to enquire about a treehouse design and learn more about how we can work together, please call on 07947341400, or complete our contact form here.